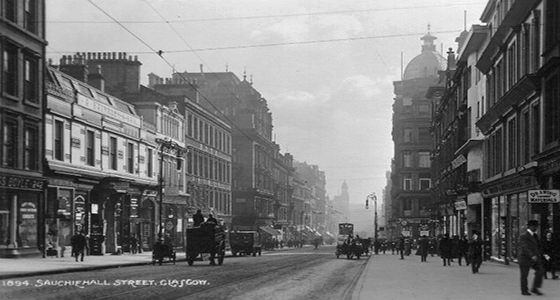 Sauchiehall Street is a long predominently commercial road that runs from the city centre out to the West End area of Glasgow and the Kelvingrove Museum. Its name roughly translates to a hall on a meadow besides a river. In the Victorian period, wealthy merchants were eager to build premises along the street which until then had been a quiet road but it was soon widedened to accommodate increasing trade and traffic. Walking along the street on a busy Saturday night is very entertaining and you are guaranteed to meet many friendly, voluble locals. Rachel: I love Glasgow and visit as often as I can. This recording was made at my favorite hotel, not far from the city centre. I will not disclose the name as I stay frequently and would not like to upset the staff or potential guests. The building is typical of those near to the University Parks area and is built of local stone. EVP 1: Rachel was talking about sitting in seances and visiting a Spiritualist Church whilst in Glasgow, prior to this reply. EVP 2: It is wonderful to know that when you visit somewhere you love, that friends on both sides want to come and say hello. EVP 2: Had to steal through, who's near? EVP 3: This response may be in relation to Rachel talking about the Spiritualist Church in relation to sitting for physical phenomena; Rachel might be considered a lay practitioner. EVP 4:This is the voice a dear communicator that is often recorded in seances. It is comforting to know that they are ale to travel to wherever we are in their dimension. The noise you can hear in the background is a bin truck reversing. EVP 5: Rachel had arrived quite late after a long drive and was very tired in the morning when this recording was made, her weariness is evident in her voice.